As President Trump approaches his first anniversary of taking office, he and others are taking stock. The president has delivered on some of his major campaign promises. Other pledges are still works in progress, while some commitments have been quietly discarded. “We confirmed an incredible new Supreme Court justice and more circuit court judges in our first year than any administration in the history of our country,” Trump said last week. “And we have many more coming.” Thanks to Senate Republican leader Mitch McConnell, Trump had a large number of vacancies to fill on the federal bench as soon as he took office. He quickly tapped Neil Gorsuch for the Supreme Court seat vacated by the late Antonin Scalia. Trump has also moved aggressively to fill lower court vacancies with young, conservative judges who could be shaping federal jurisprudence for decades to come. Though some of his nominees have withdrawn under criticism of their qualifications. The $1.5 trillion tax bill signed in December was Trump’s first major legislative accomplishment. And while many economists are skeptical the measure will spark the kind of economic growth Trump has promised, it will put more money in many Americans’ pockets. “Hardworking American families will receive tremendous tax relief,” Trump said last week. “We lowered our tax rates, nearly doubled the standard deduction, and doubled the child tax credit.” The tax savings in the bill are heavily tilted toward the wealthy. But the bill does offer some of the savings for child- and elder care that Trump promised during the campaign. The administration has moved quickly to roll back regulations adopted under previous presidents. Some of these moves have been challenged in court, but Trump and his Cabinet are chipping away at rules governing the environment, labor and finance. Just this week, a financial watchdog agency announced that it plans to reconsider an Obama-era rule governing payday lenders. “The global energy market has been turned upside down by what’s happening in the United States in terms of shale gas and shale oil,” said energy historian Daniel Yergin, vice chairman of IHS Markit. “For the industry, the notion that new regulations are not going to be imposed and that some of the regulations are going to be rolled back has been important in terms of investing. But the primary drivers are price, opportunity, and technology.” What’s more, the abundance of cheap natural gas continues to put downward pressure on demand for coal, despite Trump’s pledge to bring coal jobs back. 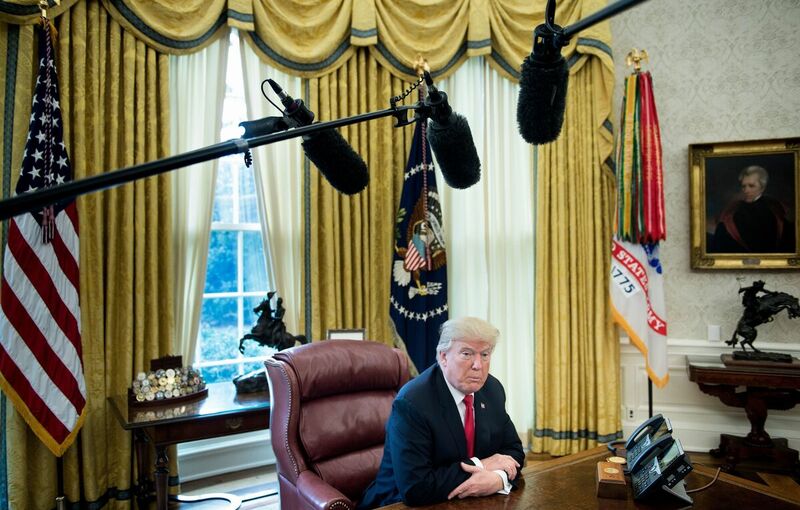 In one of his first acts as president, Trump formally withdrew the United States from a 12-nation trade deal negotiated under former President Barack Obama. That made good on a pledge Trump made during the campaign, although his rival Hillary Clinton also opposed the trade deal and Congress was unlikely to ratify the agreement in any case. “The president kept a key promise,” said Scott Paul, president of the Alliance for American Manufacturing. “I would add it was one of the easiest things for him to do.” Critics argue that withdrawal has weakened America’s standing in the fast-growing Asia-Pacific region and handed a windfall to China. Trump delivered on his promise to temporarily freeze federal hiring outside of the military, although that freeze has since been lifted. The federal government had 16,000 fewer employees in December than it did a year ago, a drop of less than 1 percent. The Trump administration has taken a hard line on illegal immigration, giving enforcement officers wide latitude to deport anyone in the country illegally, and announcing plans to phase out legal protection for undocumented immigrants brought to the country as children (putting the onus on Congress to sort a longer-term solution). So far, though, Trump has not succeeded in constructing his border wall, nor has come anywhere close to deporting the more than 2 million people he promised. After dropping sharply in the early months of the Trump administration, illegal crossings of the U.S. border with Mexico have begun creeping up again. The administration has tried repeatedly to “suspend immigration from terror-prone” regions. Early efforts were blocked by the courts, although the most recent iteration of the travel ban is in effect while legal challenges continue. The administration’s efforts to block payments to so-called “sanctuary cities” have also been stymied by lawsuits. Despite repeated efforts, the GOP-controlled Senate never mustered the simple majority needed to repeal the Affordable Care Act. The president has vowed to keep trying, although it’s not clear there’s much appetite for that in Congress during this election year. While Trump has repeatedly tried to sabotage the health care program — by halting cost-sharing subsidies to insurance companies for example and slashing its marketing budget — nearly 9 million people signed up for Obamacare coverage in the most recent enrollment period. During the campaign, Trump promised to renegotiate the North American Free Trade Agreement, end international trading abuses and impose a tariff on U.S. companies that locate factories overseas. The U.S. has entered negotiations with Mexico and Canada over NAFTA. But much of the president’s broader trade agenda has moved slowly, if at all. In the first 11 months of 2017, the U.S. trade deficit grew by nearly 12 percent. As part of his announcement in June that the U.S. would withdraw from the Paris climate accord, Trump made good on his promise to halt payments to United Nations climate funds. So far, though, there’s no indication that money has been redirected to American water and environmental projects as Trump pledged during the campaign. Trump is also working to undo the “Clean Power Plan” at the heart of former President Barack Obama’s climate agenda. But tax incentives for wind and solar power survived in the GOP tax bill signed in December. A bid to encourage $1 trillion in new infrastructure investment — using limited federal dollars to leverage private and local government money — has not yet materialized. But it may in 2018. Although Congress has not passed the crime bill Trump promised during the campaign, the administration has created a task force on violent crime and increased the availability of surplus military gear to local police. The Justice Department has also instructed federal prosecutors to seek tougher penalties for criminals — reversing an Obama-era move away from mandatory minimum sentences for low-level offenses. Trump’s effort to lift the cap on military spending and boost the defense budget substantially is one element of the budget brinkmanship playing out in Washington this week. Stay tuned. Trump quietly dropped this campaign promise after learning, belatedly, that China hasn’t been artificially depressing its currency in years. A proposed constitutional amendment to limit the terms of lawmakers seems to have dropped off the president’s radar. However, a record number of Republican House members are retiring voluntarily this year. As part of his campaign pledge to end corruption in Washington, Trump promised to impose a variety of limits on the “revolving door” between government and industry. He did impose a five-year ban on presidential appointees going to work as lobbyists, along with a lifetime ban on lobbying for foreign governments. “Those are good things,” said Noah Bookbinder, who runs the watchdog group Citizens for Responsibility and Ethics in Washington. But Bookbinder argues they don’t go far enough. The revolving door continues to spins freely in the opposite direction, as corporate lobbyists take jobs in government, often overseeing the very industries where they used to work. More than a third of the political appointees in the EPA used to work in industries such as oil, coal or chemicals, Bookbinder said. “You’ve got conflicts of interest for officials from the president on down sending a message that mixing of business interests and official responsibilities is not only something that this administration is not so concerned about but something that is maybe even encouraged,” Bookbinder said.